Researchers from MIT and Tsinghua University in Beijing are collaborating to bring new insights into how China—now the world's largest emitter of carbon dioxide (CO2)—can reverse the rising trajectory of its CO2 emissions within two decades. They use a newly developed global energy-economic model that separately represents details of China's energy system, industrial activity, and trade flows. In a recent study, the team estimated the impact on future energy use, CO2 emissions, and economic activity of new policies announced in China, including a price on carbon, taxes on fossil fuel resources, and nuclear and renewable energy deployment goals. The researchers conclude that by designing and implementing aggressive long-term measures now, Chinese policy makers will put the nation on a path to achieve recently pledged emissions reductions with relatively modest impacts on economic growth. In November 2014, the presidents of the United States and China delivered a joint announcement committing their countries to new, aggressive measures to curb carbon emissions. Those pledges were seen as a breakthrough in global climate change negotiations. Until recently, binding commitments were in place only for a group of developed nations together responsible for about 15 percent of global carbon emissions. The new action involves a developed nation and a developing nation that together represent 45 percent of all emissions today. Moreover, it breaks a longstanding stalemate between the United States and China in which each has been waiting for the other to act first, and it sets the stage for other developing nations to declare their commitments to the global effort. China's pledge represents an ambitious target for a rapidly growing country. The country pledged to turn around the constant growth in its CO2 emissions by 2030 at the latest and to increase the fraction of its energy coming from zero-carbon sources to 20 percent by the same year—approximately double the share it has achieved so far. The commitment raises serious questions: Are those goals realistic, and if so, what new actions will be needed to accomplish them? "To meet its new 2030 targets, China will need to take aggressive steps, including introducing a nationwide price on carbon emissions as well as preparing for the safe and efficient deployment of nuclear and renewable energy at large scale," says Valerie J. Karplus, assistant professor of global economics and management at the MIT Sloan School of Management and director of the Tsinghua-MIT China Energy and Climate Project (CECP). "But with strong action, China's targets are credible and within reach." Her assessment is based on studies that she and her CECP colleagues at MIT and Tsinghua University had been performing before the joint pledge was announced. The work was motivated by policy changes that were already occurring within China. In January 2013, an extreme episode of bad air quality and subsequent public outcry led to the adoption the following September of a new air pollution action plan. A few months later, Chinese policy makers at a major government summit pledged to tackle environmental problems by using new market-based instruments, including an emissions trading system that will put a price on CO2 emissions as well as taxes on fossil fuel resources that will incentivize firms to conserve energy. "So whether it was for reasons of bad air quality or greater concern about climate change or deeper interest in market reforms, the winds of change were blowing," says Karplus. "And we thought, 'Well, we need to model this!'" A theoretical analysis could produce insights into how such policies might affect China's energy system and carbon emissions, and it could shed light on the level of carbon tax that might be required to achieve a given emissions reduction—information that could help guide Chinese policy makers as they further define the details of their plans. To perform their study, the MIT and Tsinghua collaborators used the China-in-Global Energy Model (C-GEM), which MIT researchers and Tsinghua graduate students developed while the Tsinghua students were visiting MIT three years ago. "In our joint research we use a model that was built with methods largely contributed by MIT but with detailed data and insights largely provided by our Tsinghua colleagues," says Karplus. Specifically, the researchers calibrated the model using domestic economic and energy data for China in both 2007 and 2010. And rather than combining all the energy-intensive industries into a single sector, they divided that group into six distinct sectors—both within China and within the 18 additional regions that represent the rest of the world in the model. That disaggregation is important for two reasons, says Karplus: Those six sectors differ in energy intensity and growth trends, and in China—unlike in many developed economies—they make up a significant share of economic activity and account for a large share of emissions. Finally, the researchers incorporated into the model changes in China's economic structure that may occur as per capita income increases over time. In particular, the main driver of economic growth gradually shifts away from investment (for example, in infrastructure development) and toward consumption. 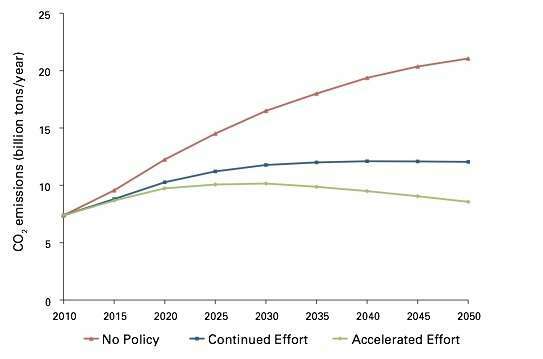 Figure 2: This figure shows total energy demand in the No Policy, Continued Effort, and Accelerated Effort scenarios, with the primary energy mix shown for the Accelerated Effort scenario only. Both levels of policy effort significantly decrease total energy demand relative to the baseline No Policy scenario, which assumes that no energy or climate policies are in effect after 2010. In their analysis of China's policy initiatives, they assume two scenarios with differing levels of policy effort, plus one more scenario that assumes that no energy or climate policies are in place after 2010—an approach that is generally viewed as unsustainable but here serves as a baseline for comparison. The detailed assumptions for each scenario appear in Figure 1 of the slideshow above. The Continued Effort (CE) scenario assumes that China remains on the path of reducing CO2 intensity (carbon emissions per dollar of GDP) by about 3 percent per year through 2050, consistent with an extension of commitments the country made at global climate talks in 2009. Importantly, the researchers find that a carbon price is needed to achieve such a reduction in carbon intensity; the needed improvements in energy efficiency and emissions do not result from normal equipment turnover and upgrading, as they have in the past. The CE scenario also assumes the extension of existing measures including resource taxes on crude oil, natural gas, and coal; a "feed-in tariff" that guarantees returns to renewable electricity generators; and increased deployment of hydroelectricity and of nuclear electricity (here assumed to be mandated by government). The Accelerated Effort (AE) scenario is designed to achieve a more aggressive CO2 reduction—4 percent per year—and includes a carbon price consistent with that target. It assumes the same feed-in tariff as under the CE scenario, but now the assumed cost of integrating intermittent renewables is lower. It also assumes higher resource taxes on fossil fuels and greater deployment of nuclear electricity beyond 2020. Figure 2 in the slideshow above shows total energy demand over time for the three scenarios, plus the actual breakdown of primary energy use by source in 2010 and estimates thereafter from the AE scenario only. Figure 3 shows total CO2 emissions between 2010 and 2050 for each of those scenarios. With no energy or climate policies in effect (the No Policy, or NP scenario), total CO2 emissions continue to rise through 2050, with no peak in sight. Rising emissions are mainly due to continued reliance on China's domestic coal resources. In 2050, more than 66 percent of all energy comes from coal—more than 2.8 times the current level, which is already widely viewed as untenable within China. In the CE scenario, total energy use is well below the NP case, and that decline generates disproportionately high reductions in emissions. Carbon emissions level off at about 12 billion metric tons (bmt) in the 2030 to 2040 time frame. The CO2 charge needed to achieve that outcome reaches $26/ton CO2 in 2030 and $58/ton CO2 in 2050. Deployment of non-fossil energy is significant, and its share of total energy demand climbs from 15 percent in 2020 to about 26 percent through 2050. Nuclear power expands significantly to 11 percent of total primary energy in 2050. Coal continues to account for a significant share of primary energy demand (39 percent in 2050). The share of natural gas use nearly doubles between 2030 and 2050, while the share of oil use increases slightly over the same period. Under the AE scenario, CO2 emissions level off in the 2025 to 2035 time frame, peaking at about 10 bmt—about 20 percent above current emissions levels. The carbon price rises from $38/ton CO2 in 2030 to $115/ton CO2 in 2050. Those prices are substantially above the levels in the CE scenario, but CO2 emissions now peak as much as a decade earlier. Figure 3: Decreases in energy demand in the researchers' Continued Effort and Accelerated Effort scenarios bring about even greater reductions in carbon dioxide emissions. While the Accelerated Effort scenario involves more aggressive measures than the Continued Effort scenario does, it causes carbon dioxide emissions to peak about a decade earlier and brings more substantial decreases thereafter. The decreases in energy demand in the Continued Effort and Accelerated Effort scenarios (Figure 3 in the slideshow above) bring about even greater reductions in CO2 emissions. While the Accelerated Effort scenario involves more aggressive measures than the Continued Effort scenario does, it causes CO2 emissions to peak about a decade earlier and brings more substantial decreases thereafter. 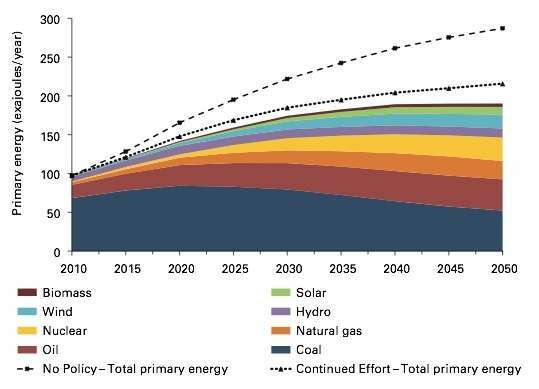 Under the AE scenario, non-fossil energy accounts for fully 39 percent of the primary energy mix by 2050. Wind, solar, and biomass electricity continue to increase through 2050 (as they do in the CE scenario), and nuclear is now 16 percent of the total energy mix. Despite its relatively low carbon content, natural gas is eventually penalized by the increasing carbon price. Between 2045 and 2050, natural gas actually starts to decline as a share in absolute terms. Coal's share drops dramatically—from 70 percent in 2010 to about 28 percent by 2050, with peak use occurring in about 2020. In contrast, oil's share of energy use continues to increase through 2050. The differing outcomes for coal and oil are largely due to the availability and cost of substitutes. Coal is the least expensive fuel to displace; it has many substitutes, including wind, solar, nuclear, and hydro in the power sector and natural gas and biomass in industrial processes. In contrast, fewer substitutes are available for oil-based liquid fuels used in transportation; and switching to the alternatives—for example, bio-based fuels or electric vehicles—is a relatively expensive way to reduce CO2 emissions. "As a result, oil consumption is relatively insensitive to a carbon price," Karplus says. "So China seems set to account for a significant share of global oil demand over the period being considered." The findings of the Tsinghua-MIT analysis have direct relevance for current policy making in China. Under the new bilateral agreement with the United States, China needs to start reducing emissions at or before the year 2030. In the AE scenario, the researchers find that by starting now, China should be able to meet that 2030 target at an added cost to the economy that rises to just 2.6 percent of China's domestic consumption by 2050—a relatively modest impact on the country's economic development. "While we are currently working on detailed calculations, we expect that the economic cost will be offset—at least to some extent—by associated reductions in the environmental and health costs of China's coal-intensive energy system," Karplus says. The CECP researchers are continuing to study how different energy and climate policies in China could be used to support the achievement of the China-U.S. agreement. For example, they are looking at the carbon trading system now being tested in several regions of China, in particular, examining which provinces win or lose under the carbon price and how policy design choices can mitigate uneven impacts. And they're investigating how a carbon price affects air pollution and how air pollution policies affect carbon emissions. Karplus stresses that their work is not meant to be a crystal ball that tells the future. "It's really intended to develop our collective intuition of the level of effort required to change China's energy system," she says. "And because the CECP involves both Chinese and U.S. contributors, we are in a position to offer analyses and outputs that we hope will be trusted and valued by policy makers in both countries as they work to strengthen the bilateral relationship." Already, Chinese policy makers are benefiting from the CECP, according to Professor Xiliang Zhang, CECP lead and director of the Institute of Energy, Environment, and Economy at Tsinghua University. He says, "The work of the CECP has played an important role in helping policy makers in China understand the challenges and opportunities that will accompany the country's low-carbon energy transformation." Can China sustain annual pollution reductions? Are you pope loving climate blame "believers" going to be pro life and anti gay now as well? He leadeth me beside his still-freezing waters. He selleth my soul for CO2. He leadeth me in his path of his self-righteousness for his own sake. I shall fear all logic for Gore art with me and thinking for me. Thy Gore family oil fortune and thy 10,000 square ft. Gore mansion, they comfort me. Thou preparest a movie in the presence of contradictory evidence. Thou anointest mine head with nonsense, my mindless conformity runneth over. And I shall dwell in the house of ALGORE forever. Why do the Deniers assume all of us have their poor character? Why do they assume science has the same "ethics" as their businesses? Under the new bilateral agreement with the United States, China needs to start reducing emissions at or before the year 2030. Ah yes, we can all use a Munich Agreement of our own! But in the meantime, lets eviscerate our economy in the interest of societal reconstruction and enriching the liberal causes. Everyone wants a clean earth. But when the effort is lead by zealots that can't or won't look at the realities of their actions, nor the factors that may or may not justify those actions, the end can only be disaster for the portion of society that brought humanity this far. Lets hope that we will have victory as in the other world crisis' that were caused by incompetents and criminals. Sadly, the price will most likely be much higher than before. Sorry, denglish, but we have survived for a few million years without an economy or money, but cannot exist without an environment, which is our life-support system. Do you really trust the Chinese to honor environmental policies? If the AGW world has its way, the US economy ought to be a shambles by 2030. No reason for China to play nice...the sheepdog will be far too emaciated to do more than whine feebly. Advanced economies are required for advanced societies. Despite the good intentions, thinking humanity can influence the earth's climate is either naive, ignorant, or criminal. A study of history will show who plays what card, and in what order. Why we just reduced CO2 to 0 we could kill allmost all life on earth, leaving more stuff for researchers at MIT and Beijing. "Do you really trust the Chinese to honor environmental policies?" Do you really think they want to continue to kill themselves? I am convinced the denialists on this site are mostly paid. Why else would they visit a science oriented site like this? Their behaviour goes beyond what one would expect from just being disgruntled or not believing the science. "denglish" is a prime example. Note that most of his/her post is a strange kind of "fluff". "A study of history will show who plays what card, and in what order." ??!! This is almost laughable. At least you'd have to pay me to make this stuff up! Previously I would not have thought this but after reading about the Russian internet trolls the online climate wars start to make more sense.